Both playoff series now stand at 2-1 with one team inching closer to a WNBA Finals berth with the other preserving its season for the time being. In Washington, Game 3 of the Mystics’ series vs. the Dream occurred. The story, of course, heading into the game was Elena Delle Donne’s knee and if her injury she sustained in Game 2 would keep her sidelined for that third game. Delle Donne did not play, but the Mystics did get a healthy showing off the bench from Aerial Powers. She led the Mystics in scoring with 18 points and five out of 15 shooting. She also had eight rebounds and was eight-out-of-eight from the line. That would not be enough for Washington as the Dream got an 81-76 victory in Game 3. Tiffany Hayes led all scorers with 23 points and also pulled in 11 rebounds. Brittney Sykes – 17 points. The Dream were also the beneficiaries of 14 from Elizabeth Williams and 10 courtesy of Alex Bentley. As for the other semifinal contest, the scene shifted to Arizona for Game 3 between the Seattle Storm and Phoenix Mercury. Phoenix kept its season alive in emphatic style by defeating the Storm, 86-66. It was the fourth quarter that made all of the difference for the Mercury as they outscored the Storm, 26-10. 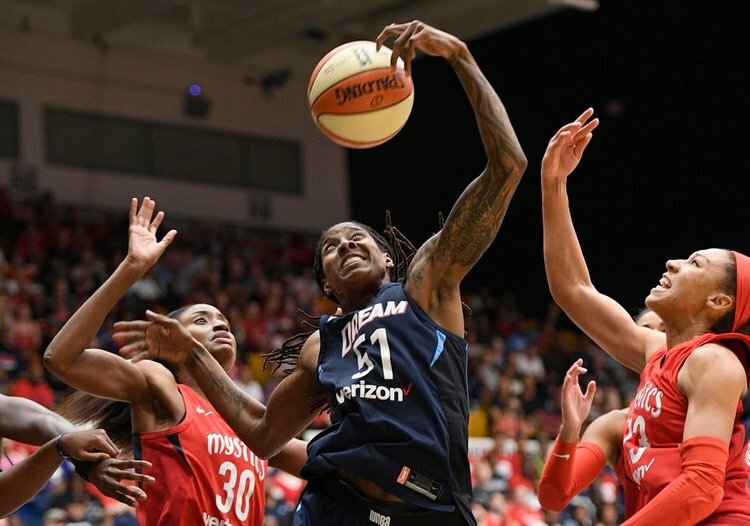 It was not the best of shooting nights for Diana Taurasi as she only scored eight points, but Yvonne Turner picked up the slack with 19 points. DeWanna Bonner and Brittney Griner each grabbed 11 rebounds with Bonner also adding three blocks to her evening. Bonner also had 27 points and Griner finished with 21. As for the Storm, they got 19 from Natasha Howard and 15 from Breanna Stewart. Sue Bird was held to an 0-out-of-8 from the field and Jewell Loyd went a mere one-for-10 from the field while only scoring two points. Both series are set to resume on Sunday with the Dream and Storm both one victory shy of what would be a rematch of the 2010 Finals when the Storm, coached by Brian Agler, swept the Dream in three games.